La France Moderne avec ses 12 anciens Gouvernement. / Generale Kaart van Vrankryk. 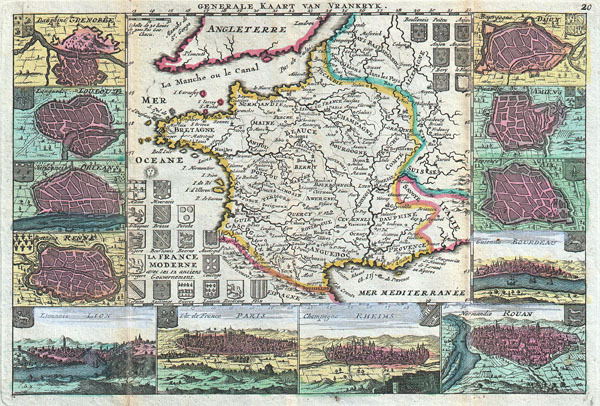 A stunning map of France first drawn by Daniel de la Feuille in 1706. Depicts all of France as well as parts of Italy, England, Spain, Switzerland, Belgium and Germany. Flanked on either side and along the bottom by plans and views of important French cities. From top left these include: Grenoble, Loulouzf, Orleans, Renne (Rennes), Lion, Paris, Rheims, Rouan (Rouen), Bourdeau (Bordeaux), Aix, Amiens and Dijon. Title cartouche in the lower left quadrant surrounded by the armorial crests of seventeen important French regions. An additional seven crests appear in the upper right quadrant. Alternate Dutch language title in upper margin. This is Paul de la Feuille's 1747 reissue of his father Daniel's 1706 map. Prepared for issue as plate no. 25 in J. Ratelband's 1747 Geographisch-Toneel.